Speaker of Parliament Karu Jayasuriya is getting flack from democratic minded Sri Lankans all over the country for failing to act to end an ever deepening political crisis caused by President Maithripala Sirisena‘s illegal sacking of Prime Minister Ranil Wickremesinghe. Colombo Telegraph reliably learns that the third citizen of the nation and head of the country’s legislature is facing a major mutiny by Parliament staff led by Secretary General Dhammika Dassanayake. Dassanayake is reportedly leading his staff to openly flout directives from Speaker Jayasuriya constantly using the refrain that he was bound as a public servant “to follow the directives issued by the Presidential Gazette”. The resistance has also prevented the Speaker from moving to reconvene Parliament in defiance of the President’s illegal prorogation of the House despite mounting calls for him to do so, since SG Dassanayake and the staff have made it abundantly clear they will not cooperate. On Monday (5) when Dinesh Gunewardena stormed into the Parliament complex with a group of Buddhist monks and decided to “assume office” as Leader of the House highly placed sources Dassanayake opened the doors to the office still legally occupied by Lakshman Kiriella. This was in spite of a specific direction from Speaker Jayasuriya that Gunewardane should not be allowed to do so. When Kiriella called the Speaker later to request him to safeguard the rights and privileges of Parliamentarians, Jayasuriya said he was “powerless” to stop the encroachment and forcible entry. 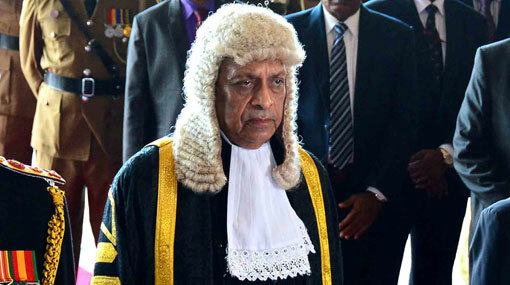 Confidants to the Speaker confirmed that he was unable to rein in the bureaucrats in Parliament because Dassanayake was insisting that he was compelled to follow the Government Gazette and was openly flouting the Speaker’s directives in a bid to please President Sirisena and his newly appointed Prime Minister. At a meeting of Party Representatives last week SG Dassanayake and his staff attended the meeting last Wednesday only as long as representatives of the illegal Government appointed on 26 October were present to submit a list of decisions made at their ‘cabinet’ meeting held that morning to the Speaker. Once Mahinda Samarasinghe, Dinesh Gunewardena and Nimal Siripala De Silva and Sarath Amunugama handed the memo over and left, Dassanayake and other staff members also walked out of the meeting. 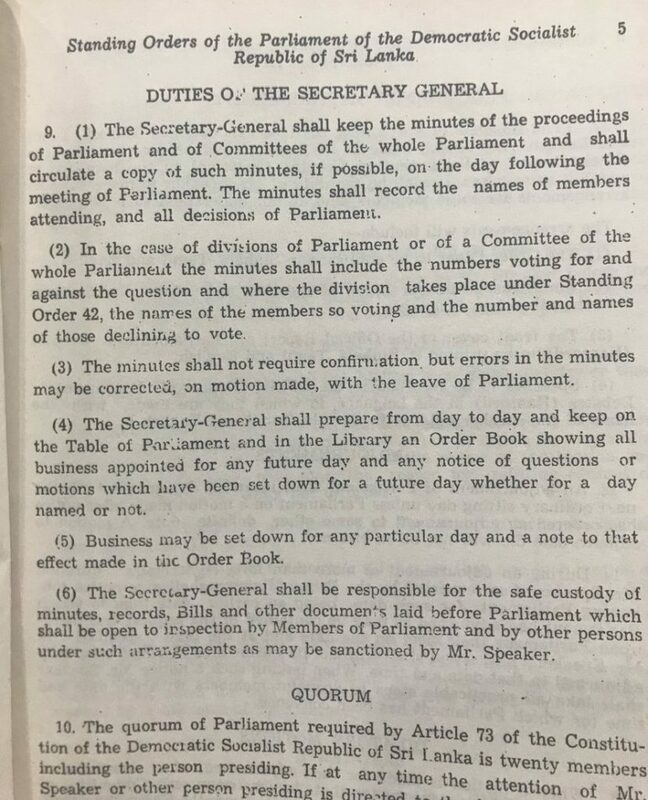 Incensed members of Parliament pitched into the Secretary General reminding him that he was an employee of Parliament and did not report to the executive. Dassanayake has reportedly informed the Speaker that if he chooses to reconvene parliament ahead of the date declared by President Sirisena – which is the wish of over 118 MPs – none of the staff would make necessary arrangements to hold the sittings. In other words staff will refuse to bring in the Mace, record proceedings or conduct any administration work necessary to hold a session. The mutiny by Parliament staff has sparked criticism about public officials being party to intentional violations of the constitution and assisting President Sirisena to execute his coup d’etat. Director Edinburgh Centre for Constitutional Law Dr Asanga Welikala took to Twitter on Tuesday to point out that the Secretary General of Parliament and the Serjeant at Arms had fundamentally misunderstood the point that their master was Parliament, and not the executive. ‏”Their mulish insistence on the proverbial gazette could be simply bureaucratic cussedness, or even a figleaf for partisanship. But the Speaker and the majority of MPs have made the position of Parliament clear, which is that it should be recalled to determine the legitimate govt. The duty of parliamentary officials is to serve Parliament, not the executive. If not, they become instruments of the destruction of parliamentary democracy. They should remember that that is very serious misconduct,” Dr Welikala said. Executive Director of Verite Research Dr Nishan De Mel said that #coupLK bureaucrats need more scrutiny. “In facing off #CoupLK the office of the Speaker @KaruOnline has faced intense scrutiny. @HarshadeSilvaMP has fine tuned that focus to the bureacracy: even Speaker might be constrained by responses of Secretary General to #lka Parliament (?) #CoupBureaucrats need more scrutiny,” Dr De Mel tweeted. UNP State Minister Harsha De Silva slammed Secretary General Dassanayake in a tweet yesterday claiming the bureaucrat had “Welcomed with glee” MP Dinesh Gunewardane to illegally occupy the Office of the Leader of the House. “Merely there to assist Speaker he is abusing power to overrule decision of Speaker Karu Jayasuriya to side with #CoupLK and President Sirisena” De Silva tweeted. Rumours are swirling that Dassanayake had already met with a sibling of Mahinda Rajapaksa to discuss non-cooperation with the Speaker of Parliament and arrangements for when Parliament eventually reconvenes.